The Archmage of Hadrumal rules the island of wizards, sanctuary for the mageborn. That suits those on Einarinn’s mainland. 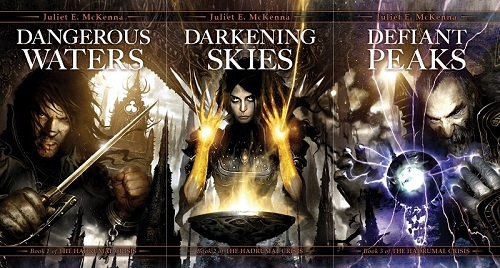 Ancient magical battles and tyrannical sorcerers may only be remembered in tavern tales but there’s still something unnerving about men and women who command air, earth, fire and water to do their bidding. The current Archmage Planir enforces the Edicts of the Council of Wizardry as all his predecessors have done. Foremost is the ban on magecraft in warfare. That suits the mainland princes. Having such might on their side isn’t worth the risk of their enemies using it against them. Besides, who but another mage has the power to discipline a wizard? But these certainties have been shaken. There is rumour of rogue wizardry in Lescar’s recent civil war. There’s the indisputable rise of Artifice, a magic of the mind from the distant mountains. Artifice is quite unlike Hadrumal’s magecraft, its adepts not subject to the Archmage’s edicts. There are corsairs raiding the Caladhrian Coast, enslaving villagers and devastating trade from Relshaz to Col. Barons and merchants beg for magical aid, arguing that wizards defending the innocent would not be breaking the Edict. In Hadrumal, Archmage Planir waits and watches, keeping his own counsel. That doesn’t suit the Masters and Mistresses of the Elements. There are too many whispers and doubts about Planir’s judgement lately, in Hadrumal and on the mainland. Once again this trilogy has its origins in a shorter piece of writing. In 2007, I wrote The Wizard’s Coming short story for The Solaris Book of New Fantasy – and that is now available as a free download and also through Amazon UK and US. In that story, I wanted to write about a corrupt wizard; a really nasty, venal, dishonest individual. So far in these books, I had written about a broad range of mages; modest, arrogant, insightful, blinkered – but never a really bad one. I coupled that with another established idea; the rule that wizards don’t engage in warfare. The thing about rules is this; there’s always going to be someone who breaks them or at very least, looks for loopholes. How would that work out, for the wizard and for someone trying to hire one? What might happen as the ripples from that single incident spread further and further? How might the Archmage handle the resulting crisis? I soon found I had a trilogy on my hands. As before, this new series is written to be accessible to readers coming fresh to this world. Also as before, some characters from previous books will be returning as the unfolding events draw them into this new story of wizardry and warfare. I’m really chuffed to see ‘Defiant Peaks’ has gone to the publisher. Can’t wait! A cheap and simple way to get started with ebooks is Ibis Reader. You upload a copy of your (epub) book to their system, and can then read it on any device that has a web browser. It’s free, and if you later decide to buy a reader you can still access it from most of them, or you can load the books into their local reading software instead. Please please please say your writing another series ion this world….. I love it!! Ps I have all your books so far! You see, at the moment, another Einarinn series by me isn’t a commercial proposition for a mainstream publisher – for a whole lot of reasons which have nothing to do with the actual books but an awful lot to do with the changes in book retailing over the past ten years. Essentially, continuing a long term series like this relies on picking up new readers to replace those who drop out along the way – which is a fact of life and publishers reckon an author carrying 80% of their readers from one book to the next is doing fine. Which is a fact of an author’s life and I’m by no means alone in this. As a reader, I’ve seen too many good writers whose work I enjoy fall by the wayside in recent years. Sigh. So, as I say, I’m thinking about it. I’ve spent the last 18 months working on a couple of books to take my writing in entirely new directions. While we wait to see how that works out, I’ll be working on getting the Aldabreshin Compass series out in ebook form – and getting all four titles ready for release much closer together than the Tales. If having my nine earlier titles available like this brings in the income I need to write a new story in this world, and to pay to get it professionally edited and buy in the other skills I need to publish a book I can be professionally proud of?